Thousands of students are flocking to 'Ocean Talent Camp' in Oslo every day to get a taste of the most exciting ocean Industry careers. Located at Rådhusplassen (City Hall Square) in Oslo, the camp gives students the chance to talk to people who work in professions they are interested in, whether they are navigators, engineers, geoscientists or production managers. This Norwegian recruitment drive builds on the success of a similar 2011 initiative, Nor-Shipping Campus. But while that campaign focused on the shipping industry only, OTC is looking to recruit talent to the “Ocean Industries” of shipping, offshore and aquaculture. Besides depending on the ocean, these three industries all struggle to recruit enough new talent to secure future growth. OTC addresses this challenge by offering a wealth of information and hands-on activities. 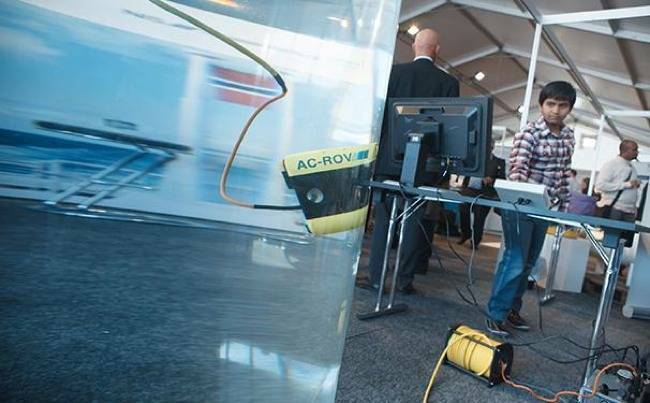 Maria Peltokangas, manager of Aker Solution’s Engineerium – an interactive technology centre for the oil and gas industry – mans one of the most popular stands at OTC. “One of the questions we ask is ‘How do you use gaming technology in the oil and gas industry?’ We give them a controller, which is just like a PlayStation controller, and show them how to use it to develop a simulator or to run remote vehicles,” she says. Although OTC is aimed at 13 to 15 year olds, older scholars and university students, politicians and the general public are also dropping by.